Scott Blake is a pop artist from Tampa Florida who currently works out of Omaha Nebraska. He uses barcodes, "the black and white icon of our data-drenched existence," to urge his viewer to "consider the limitations of digitized human expression and to appropriate these symbols of commodity." His work has been featured in the New York Times, FHM and Adbusters and is apart of public and private collections around the world. Jane Fonda's a fan. So is Barbarella. In exploring cultural icons and celebrity status through such a concentrated medium, Scott becomes intrenched in the details of his work. And so do we. Like the groundbreaking Dogtown skaters of the 1970s who transformed the concrete landscape of urban America into something beautiful, Scott Blake has translated the ultimate symbol of commodity culture and made it the center of his art. Scott's attention to detail translates well into the methodical answers he provides to a few questions about pop culture icons, faking it until you make it and what President Obama should tackle next. Can you explain the process of creating a piece of barcode art? I create all of my Barcode Portraits in Photoshop. The whole process is far from perfected, but I generally start each piece by collecting barcode numbers that correspond to the person. I search online databases like Barnes and Noble.com and eBay for as many products I can find that relate to the celebrity: UPC numbers on DVDs and CDs, or ISBNs on books. Next, I create Action Scripts in Photoshop that automatically scales, rotates, and places each barcode in place. Action Scripts are like Macros in Excel (sorta geeky), but I actually do not write any code. Photoshop can record a series of commands into a script. You can replay those Actions Scripts making the computer automatically run through the commands over and over. It is sort of like those old time pianos that play songs punched into a card. Action Scripts do not move the mouse or keyboard, but the screen is full of activity. Layers popping up, highlighting selection areas, filling patterns. I also use the Magic Wand tool a lot, which is great for people who are not familiar with Photoshop, saying I use the Magic Wand tool sounds like Harry Potter. Instead of arranging the barcodes straight up and down, I like to create unique tile patterns to add extra dimension to each portrait. For instance, Ozzy's barcodes are being shouted out of his mouth, Marilyn's barcodes wave like curly hair, and Mao radiates like a sun burst (his nickname is "The Red Sun"). Finally, I got my barcodes to scan! I have been working on a video interface that reacts to each barcode that is scanned. Each Bruce Lee barcode plays a fight scene from that DVD or scan Arnold Schwarzenegger barcodes to play corresponding movie trailers. It takes me anywhere from 2 - 6 months to complete a portrait out of barcodes with scanning video interface. What makes a particular pop culture icon appealing to become the subject of one of your portraits? I like people that are large than life like Jesus. People who think they are Jesus like Charles Manson. People who have a cult following like Oprah. People who others think are the anti-Christ like Ozzy Osbourne. People who are dead but still making money like Elvis. Supersized politicians like like Mao Tse Tung. Classic icons that never grow old like Marilyn Monroe. Generally they have to have some barcodes associated with their persona, and the more media I can find online the better. It is also important that I never met the person before. Take us through the journey of how you went from exhibiting your work in your apartment 'Ghetto Gallery', to being featured in national publications and public and private collections around the world. I'm a big believer in faking it till you make it. When I started making art, I needed a place to show people what I was working on and not worrying about selling art. So I created a faux gallery in my apartment called the "Ghetto Gallery". I would do a one night show every month or so. It was a great way to put myself out there and get real feedback on my art. The best part is the photographs from those art parties look like a real gallery show. I kept faking it until one day FHM Magazine called, and then the New York Times newspaper, and now Barcode Jane Fonda is semifinalist in the Smithsonian National Portrait Competition. Most artists are unable to make a living from their work. Why have you chosen to offer free digital copies of your work on your website? Just to be clear, I do not make a living from my work. I have part time job. Digital art can be downloaded, copied, and distributed without changing the original. I feel lucky to live in a time were I can share my art to an unlimited amount of people, not just the people that can afford it. I believe the more people that see my art the better. In paying close attention to President Barack Obama, how do you think arts and culture will fit into the future of America? Obama needs to deal with health care first, if he doesn't, I'm moving to Canada. If we were to scan the barcodes of your own self portrait, what kind of audio and video content would it lead to? I have created several self-portraits using barcodes from the foods I eat, the water bottles I drink, and rolling papers I smoke. Making the connection between you are what you put in your body. 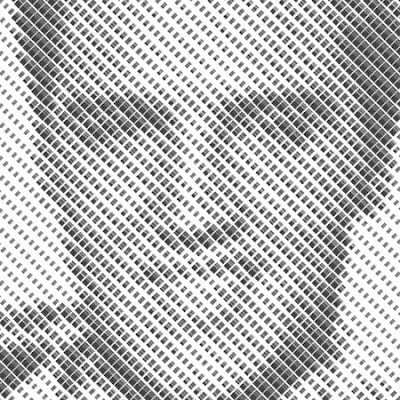 I made another self portrait using generic barcodes, but instead of numbers at the bottom, I put my name "SCOTT BLAKE" at the bottom of barcode. The idea being, I am a digital artist trying to sell designer pixels. I guess if you scanned those barcodes it could play clips from my YouTube channel. Who's your new favorite band? I listen to internet radio and podcasts 99% of the time. I bounce around WFMU, KEXP, NPR, Smoothbeats, dublab, and cliqhop on iTunes. I did just recently downloaded Girl Talk's "Feed the Animals", it was the first music I went looking for in years. See you in GB Sunday! Adding curves and dimension to the barcodes and not simply laying them in straight rectangular coordinates puts a whole new spin on the art and I completely agree, it makes it unique to the image. Otherwise, I feel it'd just be a plain old mosaic like that Star Wars "Yoda" poster made up of all the scenes from the movie. Perhaps, Mr. Blake, one day, there will be a piece of Barcode art that depicts the image of a barcode, and each of the individual barcodes will include the images of your work. By George I think you've got it never heard of the guy (Blake) before but loved the interview. Scott Blake was nice enough to post this interview on his own blog.